The Life Story Board™ Toolkit and associated Training Materials are developed and produced by Vidaview Information Systems. Vidaview is comprised of a small, multi-cultural team located across Canada and the United States, and headed by LSB creator Dr. Rob Chase MD, Dept. of Community Health Sciences, Faculty of Medicine, University of Manitoba. Canadian Rob Chase MD first began developing the Life Story Board in the mid 1990s. At that time he was doing research with Sri-Lankan children in war-affected communities, and sought to devise interview methods that were more sensitive and engaging than existing questionnaires. Since then, he and his colleagues have been developing, testing and honing many iterations of the original concept to create the robust and diversely applicable tool that the LSB is today. 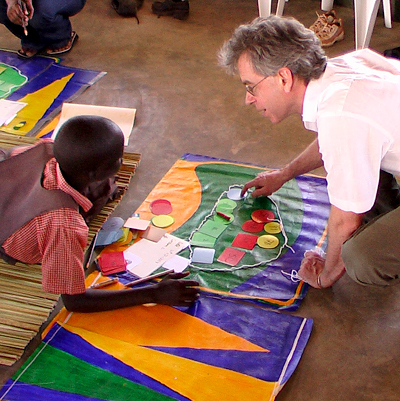 An early version of the Life Story Board was successfully pilot-tested with children in a Northern Ugandan IDP camp in 2007, through the auspices of War Child Canada. Beta versions have been used since then in a variety of North American settings with both child and adult clients: in multicultural community service agencies, schools, and private counselling practice. Ongoing evolution of the Life Story Board Toolkit and process is guided by a collaborative community of researchers and counselling professionals dedicated to exploring and refining the LSB’s potential as a clinical therapy and assessment tool, and recording system.